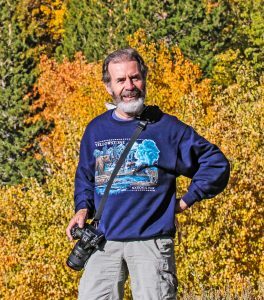 Barry Boulton of the Audubon Society presents an evening of Birds & Water, a free public slideshow and video presentation about area birds. When: Thursday, April 19, from 6-8 pm. A living creature that can fly is already way ahead in the “that’s amazing” stakes, but for some birds, amazing doesn’t quite get you there…… Take the Black Skimmer that so elegantly floats at a precise height above the water’s surface with only its longer lower mandible cutting through the water; it’s hoping to hit a small fish whereupon its bill automatically close and, hey presto, here’s a meal. You have to wonder – where did that idea come from? Then there’s the Black Turnstone (yes, the name does actually mean something) that nonchalantly flips stones over with its bill, seeking anything tasty hidden underneath. It all happens so quickly – the flip of the stone, the check for food and the decision that something is edible or not. It happens almost in a continuous movement followed by a quick scamper to the next stone – there’s no time to waste. Or the Sanderling flocks that follow the waves as they recede from shore looking for small worms and so on revealed by the receding water – and then they scamper back as the next tide comes in. They appear so sweet and naïve – but they’ve been at this for a few million years so they have it all worked out by now! Using high definition video techniques, we will watch these birds and others as they revel in their water environments to display these fascinating behaviors – they don’t mean to entertain us, but they surely do.